Human experience drives progression. An experience may inspire an individual to create, or to change, to question their beliefs, embrace an idea, or encourage the foundation of a new passion. Experience is the basis of human existence and, as such, is an incredibly powerful marketing tool. Individuals will use the experiences of others in order to help shape and legitimise their own decisions; it is a natural human instinct to review the experiences of others in order to identify potential risks or opportunities. Over the last few decades – in which TV has dominated the media landscape – the value of experiential marketing has all too often been disregarded. Brands hoping to launch effective advertising campaigns were assured that mass broadcast media was the future, and a lot of money was spent in order to perpetuate this myth. The ‘AD men’ would justify their billings by quoting TV viewing figures, and explaining how these figures would translate into an impressive ROI. To this day, broadcast media agencies will point to ROI as proof that they remain the most cost-effective way of reaching a brand’s target audience, and generating sales. Empty promises abound - “every X you spend will get you 5X back”. Without wishing to be cynical, we’re not so sure that things are quite as simple as these statistics would have everyone believe. The numbers may appear impressive, but we fear they are only superficial. In the past, we have written about the diminishing impact that traditional media outlets have on the 21st century consumer. These days, few people take notice of broadcast adverts, (if they bother to watch them at all, that is). Catch-up TV has fragmented the audience, as has the proliferation of channels. It is folly to judge a marketing campaign based on potential viewing figures alone. What percentage of these views will result in a change of behaviour? How many of these views will cause a consumer to re-assess their perception of a brand? 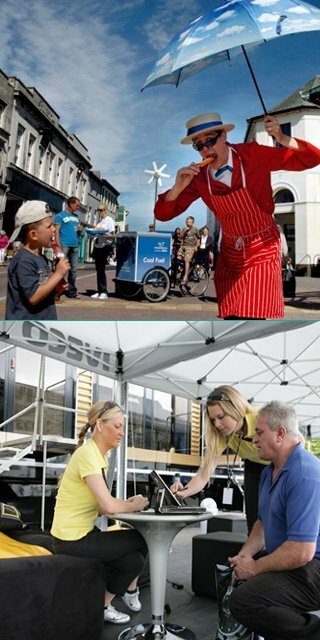 Experiential campaigns have something entirely different to offer. The sheer number of consumers reached does not take priority; to the experiential marketer, it is the quality of engagement that is king. The aim of an experiential marketing campaign is to harness the power of word-of-mouth, creating emotive experiences for consumers. Those who enjoy a positive experience are highly likely to share this with others, directly or indirectly endorsing the associated product. We call this advocate a brand champion: an individual who has the ability to influence perceptions and shift purchase behaviour across peer and tribe groups. We, the people, are the driving force in brand behavior. We, the consumers, bear such a powerful influence on the future success of any product or business. And there’s no better way to drive brand advocacy than by establishing positive brand associations within the mind of a consumer. Simply put, it’s no longer a numbers game; it’s about value of relevant engagement. 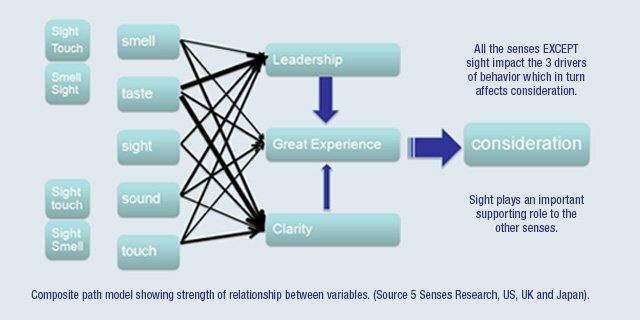 The weighting of each arrow in the composite diagram above illustrates the singular and combined persuasive power of each of the five senses. You may be surprised to learn that – independent of the other senses – sight has very little influence. Rather, it plays a supportive role in the decision-making process. This perhaps goes some way to explaining the steady demise of traditional marketing channels, which rely heavily on sight to convey a campaign message. Humans rely on all of their senses to determine the risks, threats and rewards in their immediate environment, in the same way that every animal does. Our understanding of the world is shaped by our senses; they are the windows through which our lives gather meaning, and they are inextricably linked to our subconscious mind. The art of experience marketing is to create instant surprise, encourage participation, stimulate the senses, and to immerse an individual within a campaign creative. The activation of an experiential marketing campaign can be costly. Much like a stage show, there are production and set-up costs to budget for. Add in the staffing, logistics, insurance and venue fees, and you can see how costs can begin to escalate. It’s important to drive engagement on the back of these costs to maximise campaign returns. Most smart social media experts realise that there shold be a focus on the number and quality of online interactions – interactions beyond the impetuous like. Much the same applies to experiential marketing. The focus of effective experiential should be on highly-targeted placement of a campaign that's relevant to the creative and reaches the intended audience. 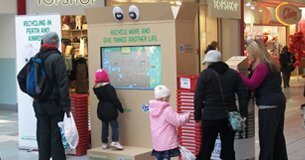 Adding extra dates to the roll-out of an experiential campaign can justify a company’s investment, as the break-even point can be reached more quickly with exposure to a greater number of the target audience. If you enable purchase at the point of engagement, you can also open a direct (and entirely measurable) ROI factor to an event. This works especially well in a retail environment, where vouchers, mobile QR codes, or NFC based incentives can drive immediate uptake. When it comes to structuring marketing spend, businesses need to shuffle the deck. Broadcast media has become so deeply embedded, that breaking free from the typical advertising model can be difficult, but we believe it is necessary to do so in order to challenge the status quo and create truly memorable campaigns. Instead of beginning with broadcast media, and working down, it’s time to start designing campaigns from the ground up. 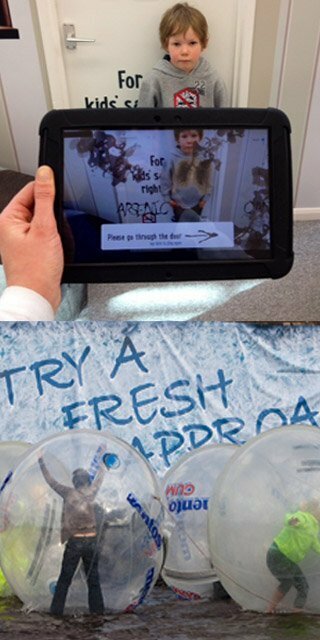 Experiential marketing allows a business to look their customers squarely in the eye, and generate a mutual rapport. The campaign messages disseminated by experiential marketing can then be repeated and reinforced through traditional media outlets, such as TV and radio. As Guerrilla Marketers with over 20 years experience, here at Kommando we try and explain to people that Guerrilla Marketing is not any particular style or discipline of marketing. It is a state of mind.